The good news is that economies the world over are set to grow. The bad news is that the growth will not be able to check unemployment that has been rising steadily since the 2008 global financial crisis. Over 202 million people were jobless worldwide in 2013, which is 25 million more than in 2008, says a report released by the International Labour Organization last month. The number of jobless will touch 215 million by 2018, says the report titled The Risk of Jobless Recovery, Global Employment Trends 2014. The young population has been the worst hit by the increase in unemployment. This is alarming when one considers that the world has never been younger. The population in the age group of 15 to 24 is the largest ever at about 1.2 billion. “It is estimated that some 74.5 million young people—aged 15-24—were unemployed in 2013, which is 1 million more than in the year before,” states the report (see table). The global unemployment rate for youngsters was 13.1 per cent, which was three times that for adults (above 24 years of age). As a result, the average age of young people entering the market has gone up in developing countries, where youngsters are turning to higher education because they are not getting jobs. In developed countries, they are waiting for the job scenario to improve. Joblessness has also pushed informal employment that accounted for 90 per cent of the employment opportunities in South Asia in 2013. It was around 70 per cent in 2011. “Even though progress in reducing poverty has been the strongest in these regions (South Asia), the lack of formal employment opportunities is likely to constitute a barrier to a sustainable further reduction in poverty,” states the report. Informal employment accounted for more than 20 per cent of the total employment in Eastern Europe and the Commonwealth of International States (countries formed out of former Soviet Union). In Latin America, it was below 20 per cent. Also, the number of working poor continues to decline globally, but at a slower rate than during previous decades. Working poor are those whose incomes fall below a given poverty line. Close to 11.8 per cent of the world’s employed workers lived on less than US$1.25 per day, whereas 26.7 per cent employed workers had to cope with US$2 a day or less in 2013. This resulted in the increase of vulnerably employed people—that is self-employed people who are financially dependent on family members. The report says 48 per cent of the workforce was financially vulnerable in 2013. The report also notes that the weak recovery of the global economy has led to a considerable increase in the average length of unemployment spells, especially in developed countries. In the crisis countries of euro area, “the average duration of unemployment has reached up to nine months in Greece and eight months in Spain. Even in countries where encouraging signs of economic recovery have appeared, such as the United States, long-term unemployment affects more than 40 per cent of all job seekers,” the report says. The increase in the average duration of joblessness has discouraged a lot of unemployed who have stopped looking for work. The present estimates of discouraged unemployed are 23 million, which will reach 30 million by 2018. 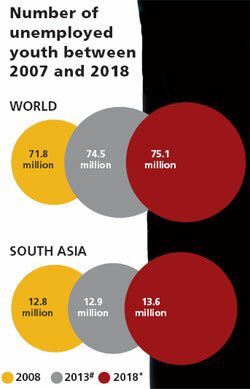 South Asia weathered the first phase of global financial crisis (2008-2010) well on the back of a growing Indian economy (9.5 per cent in 2010). 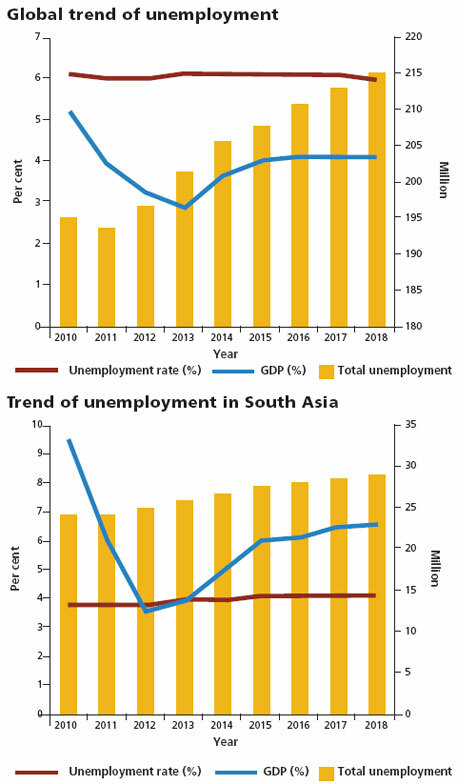 Late in 2011, the economy in the region slowed as the country’s growth faltered (see ‘Trend of unemployment in South Asia’). India’s growth slowed down because of over-dependency on services industry, which reduced manufacturing and agricultural output. The region also faced a number of macroeconomic challenges such as high inflation and bloated current account deficit. As a result, while India added a healthy 13.9 million jobs between 2009-10 and 2012-13, most were created in the informal sector. Also, the practice of contractual work increased in multinational companies in India and in South Asia during this period. This led to a substantial increase in working poor and vulnerable employment (59 per cent in 2013). The region also reported the lowest percentage of salaried class (22.5 per cent) compared to other regions. The report predicts that the employment situation in the region will not improve in the near future despite the area having a growing young population and infrastructure. The economic recovery post 2008 crisis failed to keep pace with the labour market. The employable population grew higher than the number of new jobs created. The global employment rate was 1.4 per cent in 2013—which was 1.6 per cent in the pre-crisis year. This gap led to loss of 62 million jobs in 2013. If this trend persists, by 2018, as many as 81 million people would be jobless in the world. The employed population in the world (employment-to-population ratio) has also decreased. The employment-to-population ratio, which was 60.7:100 in the pre-crisis period, was 59.6:100 in 2013 (see ‘Global trend of unemployment’). Due to persistent weak demand for final goods and services and uncertainty about future recovery, most companies in developed economies chose to wait for fresh hiring. The uncertainty was due to lack of policy coordination and continued delay in critical decisions. Governments the world over need to go for fiscal consolidation and create policies to increase labour income to improve demand for goods and services in the economy. The steps could reduce unemployment rate in G20 countries by 1.8 per cent by 2020. The report also observes that “with more and more potential workers becoming discouraged…the risk of skills degradation and obsolescence is increasing”. Hence, governments the world over should invest in labour policies to address the issue of skills mismatch. The report calls for investment in infrastructure and emphasises the need for strong social protection system for workers to improve the situation.